Deeply-rooted melodic pop, music that takes you to the conclusion that life, despite all the things we tell ourselves, may be simple after all. 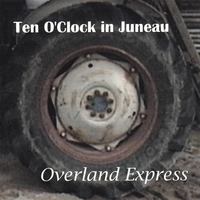 Born in the wilds of Morgantown, West Virginia, and maturing in the endless polycentric conglomeration that is Washington DC, Ten O'Clock in Juneau took form in the back room of a print shop. They soon outgrew their inky nest, which led them into the studio for a better practice and songwriting space. This album evolved from those studio sessions.